Converted from apartments to condos in 2005, Parc Vue Condominiums offer residents a prestigious location and sophisticated homes. Homes offer granite countertops, hardwood floors, stainless steel appliances, oversized windows, views from wraparound deck, designer cabinets and finishes and Jacuzzi tubs. In addition, you'll enjoy the privileges of a rooftop terrace, concierge, wellness center, pool, covered parking and 24 hour security. 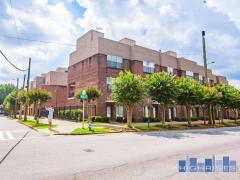 This building is ideally located less than 200 feet from Piedmont Park. Parc Vue residents are within walking distance to theatre, symphony, park, restaurants, shopping, nightlife, and MARTA. Have any comments or questions about Parc Vue? Ask your question and/or share your thoughts about this Building.